I know, the ‘Big Game’ is this weekend … but I have a shocking confession to make. I kind of don’t like football. We are a hockey family which means we love the quick pace, the action, the inevitable bout of teeth shattering fisticuffs, and the blare of the goal horn when someone tips the puck in the net! (In all honesty, I only like the Dallas Stars goal horn for obvious reasons.) Football, for all its charm, just lacks much of the pulse pounding excitement and for the most part I don’t watch. Living in Dallas it is all Cowboys all the time. I mean, have you seen ‘Jerry World’ (otherwise known as the Cowboy’s Stadium)? As if NFL games were not enough we also have some college and high school football thrown in for good measure. I grew up with it and I have never felt the same thrills with football that I do with hockey. Now, I tell you all this because we do actually watch the game … but like so many we watch for the commercials! Yes, I am a sucker for slick marketing. So, my party food is more akin to ‘Commercial Watching’ food, but if you want to be enraptured by the big game while you nosh … well these are good for that, too! 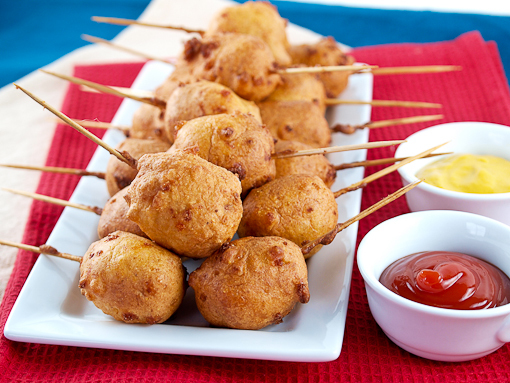 I love and adore corn dogs. Heck, the Texas State Fair is the (disputed) home of the corn dog, so I suppose it is in my DNA to like them. 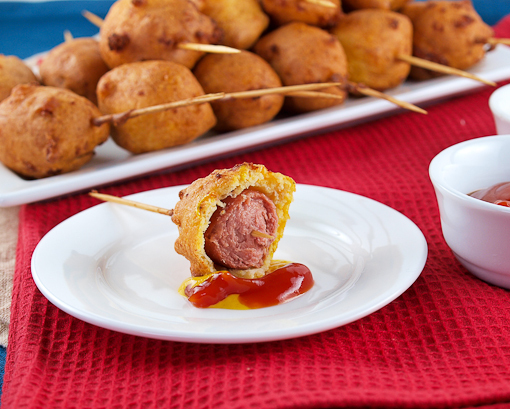 Most corn dogs have an unfortunate dog to corn breading ratio. 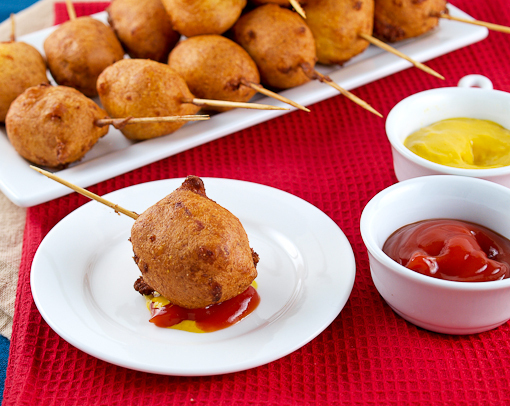 I like a nice, fluffy layer of corn batter but I like the dog to be the star. 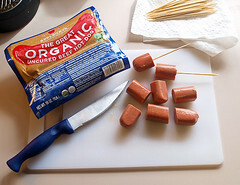 Also, speaking of the dogs, I use organic, nitrate free, all beef hot dogs and so should you (unless you are a vegetarian, then use whatever floats your veggie boat). They taste better, are better for you, and if you are going to eat something battered and deep fried quality should really count. 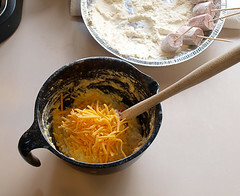 My one little tweak here to tradition is to add a little sharp cheddar cheese to the batter. You find, while eating, that you will come across little crisp cheese nuggets in the batter that I find addicting. These are wonderful for snacking, or to soak up the booze at a cocktail party, and you can fry them up to an hour ahead of serving, just stash them in a warm oven. Begin by preparing the hot dogs. Cut each dog into 4 pieces and place a small skewer or tooth pick into each dog. Pat dry with a paper towel. In a shallow dish add 1/2 cup of the flour. 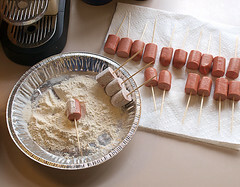 Roll the hot dogs into the flour, making sure they are completely coated, then tap off any excess. Set aside. Heat at least three inches of oil in a deep pot, allowing for two inches of space at the top of the pan to prevent overflow, to 350 F.
While the oil heats prepare the batter. 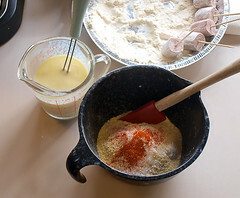 In a small bowl combine the remaining flour, cornmeal, baking soda, sugar, salt, and cayenne pepper. Whisk to combine. 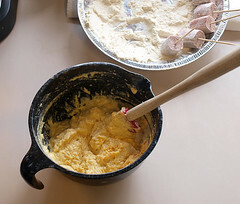 In a separate bowl whisk together the buttermilk and eggs. Pour the wet ingredients into the dry and stir gently until just combined, about 10 strokes. Add the shredded cheese and fold to combine. 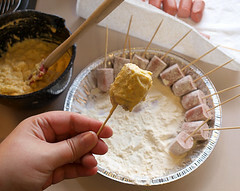 Working in small batches, about 4 to 6 at a time, dip the dogs into the batter, making sure the entire dog is coated. You may need to use a spatula to spread the batter over the entire surface. 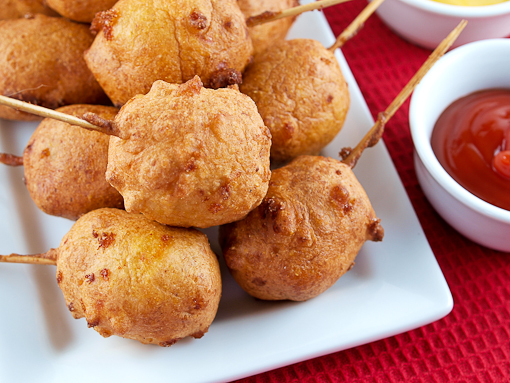 Allow any excess batter to drip off then gently lower the dogs into the hot oil. Fry until deeply golden brown, turning often to ensure even cooking, about 4 to 6 minutes. Remove from the oil and allow to drain on paper towels. Serve with your favorite condiments. Clearly, I like mustard and ketchup! Enjoy!